One day I was in the library, working on my thesis and feeling tired. I made a stop in the bathroom, looked in the mirror, and remember thinking that I looked pretty weary. Then as I was getting ready to leave the bathroom, I noticed a small Post-It note on the mirror. It said simply, “You are beautiful just the way you are.” I remember thinking that it was so refreshing to see encouragment from other women in a place where so many women look in the mirror and think critical thoughts of themselves. Suddenly, everywhere I looked, I noticed campaigns for positive body image- in my Glamour Magazine, in commercials on TV, even on TV shows. It suddenly hit me that women have made a lot of progress in seeing their bodies in a positive light in the last several years. Listed below are a few great examples of forward movement in this area that will inspire you to see yourself as already naturally beautiful. 1. 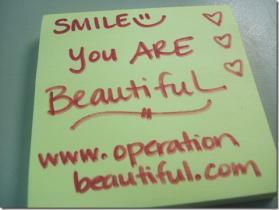 Operation Beautiful: As it turns out, the Post-It note I saw on the bathroom mirror at school was part of a project called Operation Beautiful. This genius idea by Caitlin Boyle encourages women to write uplifting, anonymous messages like “You’re beautiful,” “You’re perfect just the way you are,” and “You are beautiful because you are God’s masterpiece” on Post-It notes and post them in public places. Some of the most creative ones I noticed on Caitlin’s website were a note on a scale that said, “This number does not change who you are” and a note on a box of Slim-Fast in the grocery store that said, “You’re beautiful just the way you are.” I was so inspired by this website that I’m going to do my own Post-It note. There’s this incorrect perception of women in our society that we are hard on each other and want to tear each other down, but Caitlin’s website proves that this is a complete myth. In reality, most women want to support each other and spread the love. 2. The Dove Campaign for Real Beauty: If you are a role model in a young girl’s life, take note: Dove’s Campaign For Real Beauty hosts self-esteem workshops for girls ages 8-12 to help protect them from the pressures of idealized body image in the media. Girls attend with a mother, teacher, or other mentor in their life (fathers and male mentors can also attend) to explore self-esteem issues faced by young women. The workshops are interactive, and participants will discuss self-esteem, body image, and diversity of beauty. A portion of the proceeds from Dove products go toward these self-esteem workshops. The $10 donation required for workshop registration goes directly to the National Eating Disorder Information Centre. There is also a Dove self-esteem program available for both boys and girls called the Real Beauty School Program. 3. Glamour Magazine– In Glamour’s September 2009 issue, Akiba Solomon wrote an article entitled “What Everyone But You Sees About Your Body,” highlighting all the beautiful aspects of women’s bodies. Perhaps the most empowering thing about this article was the beautiful woman pictured on Page 194, model Lizzie Miller. This beautiful woman is a size 12-14, the size of an average American woman, and appears in the picture showing off what magazine editors called “a belly roll,” which is something I have never seen in a magazine before. It is so nice to see an average, *real* woman’s body in a magazine. This is such good news for women, especially me, because I have a little bit of a belly myself! And it’s not just me that was struck by the beauty and realness of this picture- people became so fascinated with Lizzie that she was featured on CNN, The Today Show, and Access Hollywood. To Glamour, Akiba, the photographer in this story, and Lizzie: thank you. I always felt that Glamour was one of the classier women’s magazines, and now it is proven. Even “America’s Next Top Model” is making strides toward a more diverse definition of beauty. Whitney Thompson, a plus-sized model, won Cycle 10 of the show, and the current season features only models under 5’7″ (unusually short for “typical” models). Although I watch and love “America’s Next Top Model,” I would not recommend it for young women still developing their body image, but at least Tyra Banks and the show are making some strides toward a more diverse definition of beauty. I could not write a column about body image without mentioning anorexia and bulimia and where to find help if you feel that you or someone you care about is suffering from either of these disorders. According to the DSM-IV-TR (American Psychiatric Association, 2000), anorexia nervosa refers to a refusal to eat due to an intense fear of gaining weight. Purging, or throwing up/expelling what one has eaten, can also be a part of anorexia (the person may cycle back and forth between refusal to eat and binge-eating/purging). Bulimia nervosa refers to the tendency to binge, or eat much more food than most people would within a 2-hour period, and purge, or throw up or expel what has been eaten because of an intense fear of gaining weight. If you feel that you or someone you care about is suffering from anorexia or bulimia, the APA website offers a listing of therapists in every state. All in all, I think women have finally said “enough is enough” to the unrealistic images of beauty portrayed in the media. Women already have a lot to be proud of. Check out the above websites, magazines, etc. for inspiration, and remember: you are beautiful inside and out. In all mental health-related stories, it is important to mention what to do if you are feeling depressed or suicidal. If you are feeling depressed, find a therapist in your state at the APA website listed above. If you are feeling suicidal, please call the Suicide Hotline at 1-800-SUICIDE (784-2433) or 1-800-273-TALK (8255). Please know that suicide is *not* the answer for your pain, and please *do not* commit suicide- you are special and loved, and you *will* find help and hope. To the Mental Health Minute readers – I apologize for my long hiatus. I am working on my thesis, and things have been really busy, but I have missed writing for the Good News Network. Until I complete my thesis, I will probably be writing one story a month. Thank you all for your support of the column, and I hope you enjoyed the latest installment. Cristina Frick is a contributing writer and volunteer editor at the Good News Network since 2006. She is currently completing her Master’s degree in Clinical and Community Psychology at the University of North Carolina at Charlotte and plans to graduate in December. View a list of all of Cristina’s articles here — including previous columns in her Mental Health Minute series.